from the National Association of Nutrition Professionals and the Nutritional Therapy Association. For attendees of the Online Seminar a test will be required for credit. For attendees of a Live Seminar no test is required. Your professional CEU certificate for attendance & participation for the Seminar will be emailed to you within three business days following completion of the test. It is up to your Certifying Board whether or not they will accept CEU credits from the NANP and NTA. We apologize, but we do not issue letters of attendance with hours of instruction in lieu of a purchased Certificate of Attendance & Participation. The process to qualify the program for CEU credit is costly, and to remain in compliance with our agreement we must require purchase of the certificate. 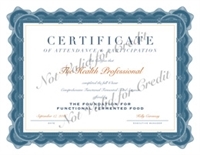 For the live Seminar, automatically receive a Certificate of Attendance for 6 CEUs the week following the Seminar. For the Online Seminar, your Certificate will be issued within three business days following a passing grade on the test. Submit to your certifying board for credit. Acceptance is at the discretion of your certifying board. The National Association of Nutrition Professionals (nanp.org) has approved CEUs for this course. We are currently applying to other certifying boards. If you are licenced through another body, please contact us and suggest that we apply for their certification. © Copyright 20165 www.fermentingseminar.org. All Rights Reserved.